What was it like to be an American Civil War Soldier? The life of a soldier in the 1860s was a arduous one and for the thousands of young Americans who left home to fight for their cause, it was an experience none of them would ever forget. Military service meant many months away from home and loved ones, long hours of drill, often inadequate food or shelter, disease, and many days spent marching on hot, dusty roads or in a driving rainstorm burdened with everything a man needed to be a soldier as well as baggage enough to make his life as comfortable as possible. There were long stretches of boredom in camp interspersed with moments of sheer terror experienced on the battlefield. For these civilians turned soldiers, it was very difficult at first getting used to the rigors and demands of army life. Most had been farmers all of their lives and were indifferent to the need to obey orders. Discipline was first and foremost a difficult concept to understand, especially in the beginning when the officer one had to salute may have been the hometown postmaster only a few weeks before. Uniforms issued in both armies were not quite as fancy as those worn by the hometown militias and soldiering did not always mean fighting. 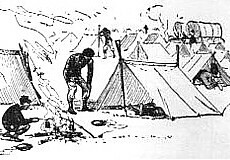 There were fatigue duties such as assignments to gather wood for cook fires. Metal fittings had to be polished, horses groomed and watered, fields had to be cleared for parades and drill, and there were water details for the cook house. Guard duty meant long hours pacing up and down a well-trod line, day or night, rain or shine, always on watch for a foe who might be lurking anywhere in the hostile countryside. A furlough was hard to come by as every man was needed in the field and few men had a chance to ever visit home. 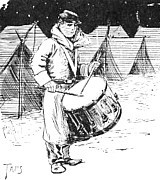 Marching and fighting drill was part of the daily routine for the Civil War soldier. Infantry soldiers drilled as squads and in company formations, each man getting accustomed to orders and formations such as marching in column and in a "company front", how to face properly, dress the line, and interact with his fellow soldiers. After an hour of drill on that level, the company moved onto regimental level drills and parades. The soldier practiced guard mount and other procedures such as the Manual of Arms, which infantrymen learned for the rifle-musket. Veterans of the war often remarked how they could recite the steps of loading and priming for many years after the war, thanks to the continual drill. The drill was important for the infantry for they used tactics that had changed little since the time of the American Revolution or the age of Napoleon: infantry fought in closely knit formations of two ranks (or rows) of soldiers, each man in the rank standing side by side. This formation was first devised when the single-shot, muzzle loading musket became the normal weapon on the battlefield, the close ranks being a necessity because of the limitations of the musket. Yet, by 1861, new technology had made the old fashioned smoothbore musket nearly obsolete with the introduction of the rifle musket. By the time of the Gettysburg Campaign, the rifle musket made up the majority of infantry weapons in both the Union and Confederate armies though it took much longer for the tactics to change. Even with the advance of the rifle musket, the weapons were still muzzle loaders and officers believed that the old-fashioned drill formations were still useful to insure a massing of continuous firepower that the individual soldier could not sustain. The result of this slow change was a much higher than anticipated rate of casualties on the battlefield. 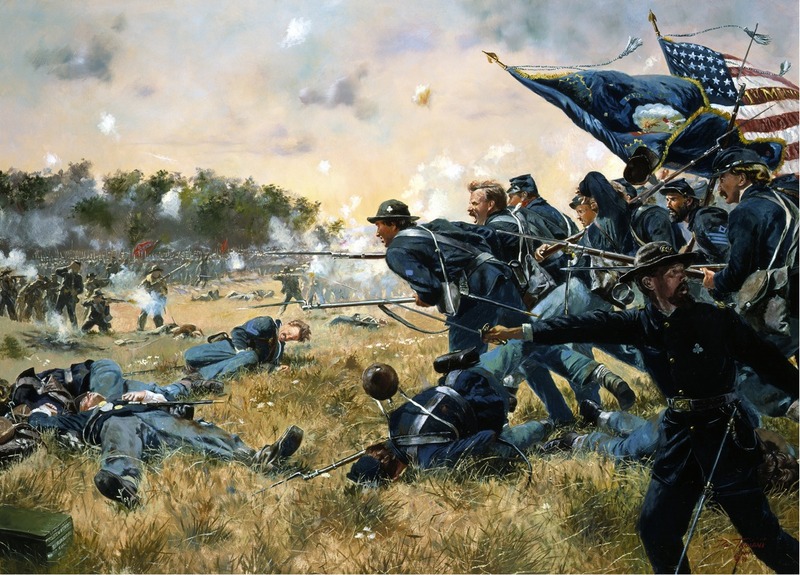 (About) 1st Minnesota Volunteers advancing during Battle of Gettysburg. 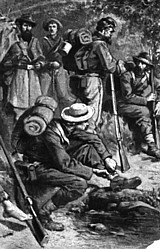 The soldier of 1863 wore a wool uniform, a belt set that included a cartridge box, cap box, bayonet and scabbard, a haversack for rations, a canteen, and a blanket roll or knapsack which contained a wool blanket, a shelter half and perhaps a rubber blanket or poncho. Inside was a change of socks, writing paper, stamps and envelopes, ink and pen, razor, toothbrush, comb and other personal items. The amount of baggage each soldier carried differed from man to man. The southern soldier was highly regarded for traveling with a very light load basically because he did not have the extra items available to him that the northern soldier had. Southern uniforms were quite different from the northern uniforms, consisting of a short-waist jacket and trousers made of "jean" cloth- a blend of wool and cotton threads which was very durable. Dyed by different methods, the uniforms were a variation of greys and browns. Northern soldiers called Confederates "butternuts" because of the tan-grey color of the uniforms. Vests were also worn and were often made of jean material as well. Shirts and undergarments were universally of cotton material and often sent to the soldiers from home. Southern-made shoes were of very poor quality and difficult to obtain. Union uniforms were universally of better quality because of numerous mills throughout the north that could manufacture wool cloth and the steady import of material from Europe. The Union soldier's blouse and trousers were wool and dyed a dark blue until 1862 when the trouser color was altered to a lighter shade of blue. The floppy-crowned forage cap, made of wool broadcloth with a leather visor, was either loved or loathed, but universally worn by most soldiers in the Army of the Potomac. Each soldier would adorn his cap with brass letters of the regiment and company to which he belonged. Beginning in 1863, corps badges were designed for the different army corps and these were universally adopted for the top of the cap. 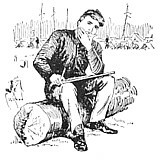 Like their Confederate counterparts, most Union soldiers disdained the itchy wool flannel army shirt for cotton shirts and undergarments sent from home. Leisure activities were similar in either army and most of it was spent writing letters home. Soldiers were prolific letter writers and wrote at every opportunity. It was the only way for them to communicate with loved ones and inform the home folks of their condition and where they were. Thrifty soldiers sent their pay home to support their families and kept only a small amount to see them through until the next payday. The arrival of mail in camp was a cause for celebration no matter where the soldiers were and there was sincere grumbling when the mail arrived late. The lucky soldiers who received a letter from home often read and re-read them many times. Packages from home contained baked goods, new socks or shirts, underwear, and often soap, towels, combs, and toothbrushes. Union soldiers often spent their free time at the sutler's store, comparable to the modern post exchange, where they could purchase toiletries, canned fruit, pocketknives, and other supplementary items, but usually at exorbitant prices. A private's salary amounted to $13.00 per month in 1863 and those unfortunates who owed the sutler watched as most of their pay was handed over to the greedy businessman on pay day. Confederates did not have the luxury of sutlers, which disappeared soon after the war began. Instead they depended on the generosity of folks at home or farmers and businessmen near the camps. Despite orders to the contrary, many soldiers kept pets with them including dogs, cats, squirrels, raccoons, and other wildlife. One regiment from Wisconsin even had a pet eagle that was carried on its own perch next to the regimental flags. General Lee was purported to have had a pet chicken that faithfully delivered a fresh egg for the general everyday. By far the most popular pets appears to have been dogs and their presence with a master in camp or on the march was often overlooked by high commanders. 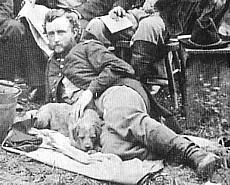 Many officers, including General George Armstrong Custer who kept a number of dogs around his headquarters, favored the hardiness of these loyal companions and their companionship was, as one soldier put it, a "soothing connection" with home. Both the 11th Pennsylvania Infantry and the 1st Maryland Infantry (CSA) had singular dogs that followed the men through the most difficult campaigns including Gettysburg. Sallie, the 11th Pennsylvania's unofficial mascot, is remembered in a bronze likeness on the regimental monument at Gettysburg and symbolized there for its loyalty to the dead of the regiment. The canine that accompanied the 1st Maryland was regrettably killed in action on July 3 at Culp's Hill, after having participated in the charge of the regiment. So struck by the animal's gallantry and loyalty to its human companions, a Union officer ordered the animal be given a proper burial alongside the dead of 1st Maryland. Discipline in the military was very strict. The Provost Marshal of the army was responsible for enforcing military rules, but regimental commanders also had the authority to dole out punishments for minor offenses. 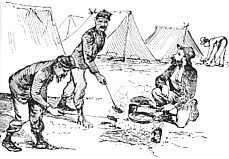 Petty offenses such as shirking camp duty or not keeping equipment in good order were usually treated with extra duties such as digging latrines, chopping wood, or standing extra hours on guard duty. Insubordination, thievery, cowardice, or other offenses were more serious and the guilty party was usually subjected to embarrassing punishments such as carrying a log, standing on a barrel, or wearing a placard announcing his crime. "Bucking and gagging" was also common punishment- the soldier's limbs were bound and he was gagged so he could not speak. In the artillery, the guilty person might be tied to the spare wheel on the back of a caisson. Desertion, spying, treachery, murder, or threats on an officer's life were the most serious offenses to which the perpetrator was condemned to military prison or shot by a firing squad. Crimes committed against civilians were also punishable by the army and felons were executed by hanging before a formation of soldiers. Sickness and disease was the scourge of both armies and more men died of disease than in battle. Sanitation in the camps was very poor. Germs and the existence of bacteria had not yet been discovered, and medical science was quite primitive by today's standards. 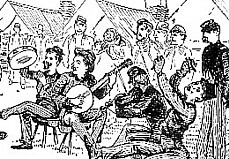 Morning sick call was played in camp and ailing soldiers trudged to the surgeon's tent where the "sawbones" examined the sick. Quinine or other stimulants were administered, including an elixir called "Blue Mass". Whiskey was universally given for most ailments as was brandy and other stimulants. Extremely ill soldiers were sent to brigade hospitals where most were further affected by disease. Thousands of men in both armies died without ever firing a shot in battle. The singular purpose of the soldier was to fight a battle and win. There were a variety of firearms used during the Civil War. The average infantryman carried a muzzle-loading rifle-musket manufactured in American arsenals or one purchased from foreign countries such as England. The bayonet was an important part of the rifle and its steel presence on the muzzle of the weapon was very imposing. When not in battle, the bayonet was a handy candle holder and useful in grinding coffee beans. The typical rifle-musket weighed eight and one-half pounds and fired a conical shaped bullet called the Minie Ball. Bullets were made of very soft lead and caused horrible wounds which were difficult to heal. The artillery was composed of both rifled and smoothbore cannon, each gun served by a crew of fourteen men including the drivers. The role of the artillery was to support the infantry while the infantry role was to either attack or defend, depending on the circumstances. Both branches worked together to coordinate their tactics on the field of battle. Cavalrymen were armed with breech loading carbines, sabers, and pistols. Cavalry was initially used for scouting purposes and to guard supply trains. The role of mounted troops had expanded by the time of Gettysburg, with cavalry divisions acting as skirmishers and fighting mounted and on foot in pitched battles such as Brandy Station, Virginia on June 9, 1863. Other branches of the armies included the signal corps, engineers, medical and hospital corps, as well as supply organizations including the quartermasters. 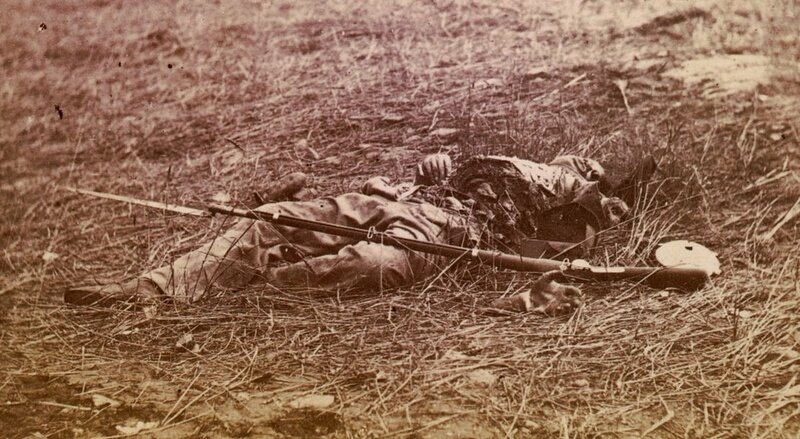 (About) Union soldier disemboweled at the Wheatfield, Battle of Gettysburg. The end of the war in 1865 brought a welcome peace, especially for the men who served as soldiers. Armies were disbanded and regiments mustered out of service. Former soldiers returned to the farms and stores they had left so long ago, but the memories of their service and old comrades did not disappear quite so rapidly. In the decade following the end of the Civil War, organizations of veterans of the North and South were formed. Northern veterans joined the Grand Army of the Republic and Confederate veterans enrolled in the United Confederate Veterans. For many years, G.A.R. posts and U.C.V. chapters met over reunion campfires retelling stories and recalling the friends who did not return. Many veterans wrote articles, stories, and poems for the magazines of both organizations. The G.A.R. and U.C.V. held powerful influence in political circles from 1878 through the turn of the century, but their influence faded as veterans in congress retired and passed out of politics. The last hurrah for both organizations came at The Great Gettysburg Reunion of 1913 when 54,000 veterans attended the 1913 Anniversary celebration and Grand Reunion, and both organizations formally joined in a singular purpose of national unification and peace. America's involvement in the Great War (World War I) four years later brought hundreds of aged "Yanks" and "Johnnies" out to march together in military parades for one last time before they quickly faded into the background as the nation's attention focused on her "doughboys" serving in Europe. Recommended Reading: Life of Billy Yank: The Common Soldier of the Union (488 pages) (Louisiana State University Press). Description: This fascinating social history reveals that while the Yanks and the Rebs fought for very different causes, the men on both sides were very much the same. "This wonderfully interesting book is the finest memorial the Union soldier is ever likely to have. . . . [Wiley] has written about the Northern troops with an admirable objectivity, with sympathy and understanding and profound respect for their fighting abilities. He has also written about them with fabulous learning and considerable pace and humor. Sources: Bell Irvin Wiley, The Life of Billy Yank, The Common Soldier of the Union, Louisiana State University Press, Baton Rouge, 1952 & 1978; Bell Irvin Wiley, The Life of Johnny Reb, The Common Soldier of the Confederacy, Louisiana State University Press, Baton Rouge, 1943 & 1978; John D. Billings, Hardtack & Coffee or The Unwritten Story of Army Life, Benchmark Publishing Corp., Glendale, NY, 1970 (reprint); National Park Service; National Archives; Library of Congress; Gettysburg National Military Park; Official Records of the Union and Confederate Armies.